Moses 'straight up' was my decision for one year's confirmation class. 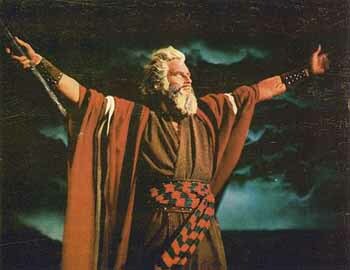 Instead of using an engaging, sharply-focused contemporary movie-through which we would explore the story of human liberation in which all of us, individually and corporately, are engaged, and then examine the parallel story in the Book of Exodus-I chose to go directly to the story itself, using Cecil B. DeMille's, "The Ten Commandments." It was a disastrous decision. Dramatically portrayed in vivid Technicolor, and unimaginatively literal, the story of Moses, the Exodus, the Ten Commandments and the wanderings in the wilderness became encased in concrete in the youth's minds. By movie's end, the youth were impervious to my subtle and, then, my very explicit suggestions that the burning bush experience was Moses' poetic way of talking about an indescribably profound personal experience. Fire shooting from the clouds and burning the commandments into the stone tablets was far more vivid than my more likely explanation that the laws, formulated in the crucible of community life, were given divine sanction through the story told. Try as I might, I could not pry the youths' minds from the literalism on the screen to see the deeper human story in which they, like Moses and the ancient Israelites, participate. The phrase, 'seeing is believing,' was created just for situations like this. Becoming aware of the divine stirring around in their own lives, and in the world's life, may come to them, but if so, it will be with an unnecessary struggle. Watching that movie only made it more difficult to break free from the literalism that enslaves the mind. Biblical literalism stunts the spiritual search. Biblical literalism leads to dogmatism and an us-versus-them outlook (witness the current struggles of the Southern Baptist Convention). Biblical literalism prolongs the conflict between the teaching of creationism and evolution in public schools. Biblical literalism requires us to swallow whole the Jonah story. Biblical literalism turns evocative poetry into pedestrian prose. Yet, even biblical literalists make some room for non-literal readings in the Bible. Literalists accept the poetry of the Psalmist "and the mountains clapped their hands in joy." Literalists do not assume a specific family is referred to in Jesus' Parable of the Prodigal Son. Literalists do not assume they are a body part when Paul writes of each church member being a part of the 'body of Christ." Dozens of people in Jesus' world were acclaimed as being born of a virgin, including the Emperors. A virgin birth was a way of verbally stating the early reason for a person's later significance. To literalize the virgin birth stretches credulity and history. Until I engaged in the struggle for the minds of those ninth grade confirmation youth, I had not realized the true, even frightening, power of images. Until then I had not realized how black-and-white was the thinking and judging of youth that age. The combination of was potent that weekend. Among all the images etched on their brain that weekend, I only hope there is an additional remembrance of their wild-eyed leader speaking, and then repeating the words several times: "What you saw isn't the way it happened. The story is true, but not factual."